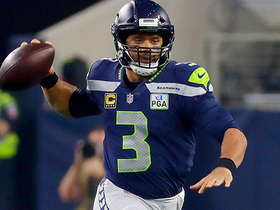 Wilson reached agreement Tuesday with the Seahawks on a four-year, $140 million contract extension, Brady Henderson of ESPN.com reports. Analysis: Though Wilson set a deadline of midnight Monday for reaching a new extension, the two sides were willing to negotiate until the early hours of Tuesday and ultimately consummated a record-setting deal. Wilson's contract is worth an average of $35 million from 2020 through 2023, including a league-record $65 million signing bonus. The 30-year-old's deal also includes a no-trade clause, likely ensuring that he finishes out his prime years in Seattle. 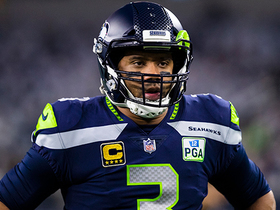 Wilson will attend the start of the Seahawks' offseason program Monday, whether he has a new deal in place or not, Bob Condotta of The Seattle Times reports. Analysis: Monday is Wilson's self-imposed deadline for a new contract as he enters the final season of his four-year, $87.6 million deal. He's looking for a huge payday, but a holdout apparently won't be part of of the plan. The 30-year-old quarterback will probably be willing to listen to offers even if the contract isn't finished by Monday. 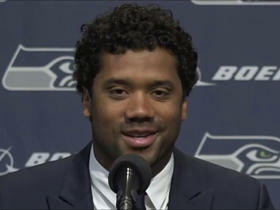 Wilson told the Seahawks he wants a new contract before April 15, Bob Condotta of The Seattle Times reports. Wilson and the Seahawks haven't engaged in any discussions to extend his contract beyond 2019, Adam Schefter of ESPN.com reports. 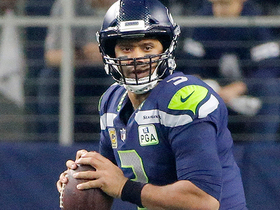 Wilson completed 18 of 27 passes for 233 yards and a touchdown in Saturday's playoff loss to the Cowboys. He also rushed three times for 14 yards and a touchdown. Wilson completed 12 of 21 pass attempts for 152 yards, with one touchdown and one interception during Sunday's 27-24 win against Arizona. Wilson completed 18 of 29 passes for 271 yards and three touchdowns in Sunday's 38-31 win over the Chiefs. He also rushed eight times for 57 yards. 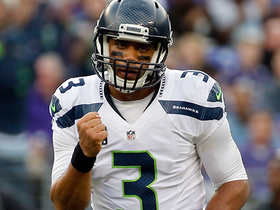 Wilson completed 23 of 31 passes for 237 yards and two touchdowns in Sunday's overtime loss to the 49ers. Wilson completed 10 of 20 passes for a career-low 72 yards and an interception in Monday's 21-7 win over the Vikings. He also rushed seven times for 61 yards. Wilson completed 11 of 17 passes for 185 yards and four touchdowns in Sunday's win over the 49ers. He rushed four times for 14 yards. Wilson completed 22 of 30 passes for 339 yards and two touchdowns in Sunday's win over the Panthers. Wilson completed 21 of 31 passes for 225 yards and two touchdowns in Thursday's 27-24 win over the Packers. He also rushed five times for 17 yards. Analysis: The Seahawks played from behind for most of the game so Wilson tossed more than 30 passes for just the second time in eight games. His game was highlighted by a game-winning drive in the fourth quarter where he completed four of five passes for 73 yards and a touchdown to Ed Dickson. It keeps the Seahawks alive in the playoff hunt, and Wilson will have extra rest ahead of Week 12's matchup with the Panthers. Wilson completed 17 of 26 passes for 176 yards and three touchdowns in Sunday's 36-31 loss to the Rams. He also rushed nine times for 92 yards. Analysis: Wilson's efficient offense kept the Seahawks in the game, and a late touchdown pass to Mike Davis put them within one score with two minutes to go. Seattle got the ball back with 1:24 left in the contest, but Wilson completed just one of five passes for 29 yards on the final drive and fell short once again. Wilson and the Seahawks have a short week ahead of a home game versus the Packers on Thursday, which is shaping up to be a must-win situation for both sides. Wilson completed 26 of 39 passes for 235 yards, two touchdowns and one interception in Sunday's 25-17 loss to the Chargers. He also ran five times for 41 yards. Analysis: This marked the most passes Wilson attempted this season, and it was the first time in three games he threw more than 23 times. He wasn't effective with 6.0 YPA, but the offensive line let him down as he was constantly under siege and was sacked four times. 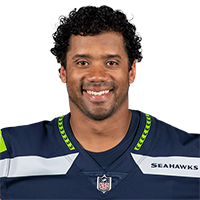 Wilson will travel to Los Angeles to face the Rams in Week 10, where he threw for 198 yards and three scores earlier this year. 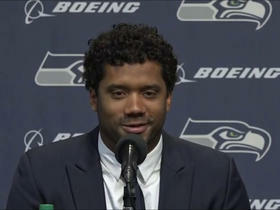 Seattle Seahawks quarterback Russell Wilson announces contract extension on Twitter with Ciara. 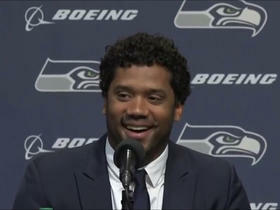 The "Good Morning Football" crew discuss if the Seattle Seahawks and quarterback Russell Wilson can come to a deal. 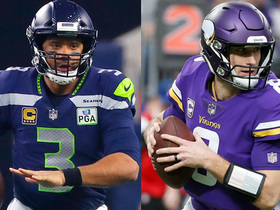 The "Good Morning Football" crew discusses if Seattle Seahawks quarterback Russell Wilson be the Giants new quarterback in 2019. 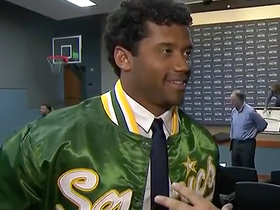 NFL Network's Tom Pelissero reports the latest on contract negotiations between the Seattle Seahawks and quarterback Russell Wilson.